The initial blood system forms from angiogenic cells that split into the dorsal aorta tubes and the ventral cells fuse to form the heart tube. The heart tube contains an arterial pole, bulbus cordis, ventricle, atrial, and venous pole outpouchings. The arterial pole form into the aorta. The bulbus cordis, after some folding, forms into the right ventricle. The ventricular outpouching becomes the left ventricle. The atrial sections form the right and left atrium by folding behind and moving superiorly to the right and left ventricles. The venous poles split into the anterior and posterior cardiac veins, the umbilicial veins, and the vitilline veins. The right vitelline vein becomes the inferior vena cava. The right anterior cardiac vein becomes the superior vena cava. The right umbilical vein, the left vitilline vein, and the left umbiliical vein regress and disappear. The remnants of the connections of the posterior cardiac vein to the right vitilline vein forms into the coronary sinus. The left anterior cardiac vein forms into left superior vena cava if it persists, otherwise, it regresses. 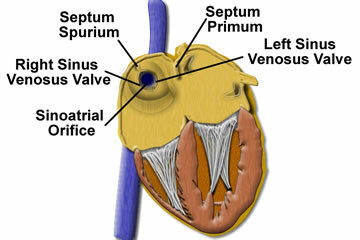 During early cardiac development, there are two valves guarding the sinus venosus, the right and left valves. The right valve normally regresses during the 9-15 weeks with the superior portion forming the crista terminalis, and the inferior portion developing into the eustachian valve of the inferior vena cava and the thesbian valve of the coronary sinus. The inferior or right sinus valve is responsible for directing blood toward the atrial septum and the left atrium. Lack of normal regression of the right valve of the sinus venosus can result in abnormal septation of the right atrium by a prominent Eustachian valve to the complete division of the right atrium (cor triatriatum dexter). Extensive fenestration of the right sinus valve can result in a web like structure called a Chiari Network. Embryologic development of the interatrial septum is in stages. Initially an anteroposterior partition, the septum primum, grows down from the superior border of the common atrium to divide the right from the left atrium. Before it reaches the endocardial cushion, its superior connection with the atrial roof is severed and it is free. Failure of the septum primum to form or to incompletely form, will cause an atrial septal primum defect. The septum secundum grows downward from the atrial roof until its edge overlaps the superior border of the septum primum. These overlapping membranes form a flap between the two atria with the secundum to the right of the primum. Before birth the RAP is increased which opens this flap and the blood flows through this flap to the left atrium. After birth, with the establishment of normal pulmonary blood flow, the gradient between the left and right atrium is reversed and the increase left atrial pressure keeps the flap closed. Failure of the septum secundum to form or to incompletely form, will cause a atrial septal secundum defect. In 75% of individuals, the opposing surfaces of the flaps fuse, causing the septum secundum to form the superior crescent shape of the foramen ovale. In the other 25%, the surfaces fail to fuse. As a result, the septum remains anatomically open but functionally closed. This is called a patent foramen ovale (PFO). If right atrial pressure is greater than left atrial pressure (e.g. pulmonary hypertension, severe tricuspid regurgitation, right ventricular failure, etc), the PFO can open and create a right-to-left shunt.